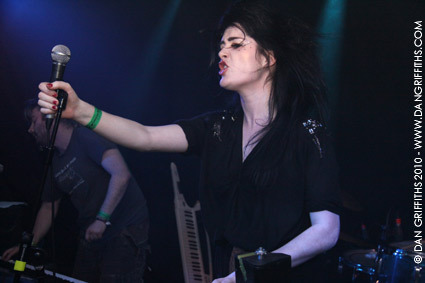 These shots of Irish quartet Fight Like Apes were taken last night at the Barfly in Camden. 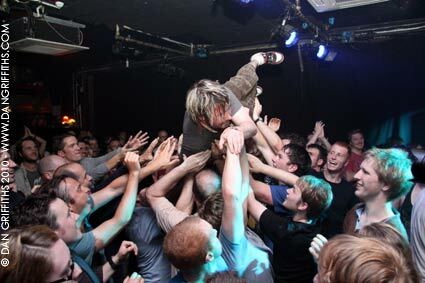 Only the drummer resisting diving into the crowd mid-set with both keyboard player ‘Pockets’ and bassist Tom crowd surfing to the exit and their dressing room at the end of the set. See more images from the night by clicking either image to launch a slideshow. Fight Like Apes have toured the UK with The Von Bondies, The Ting Tings, The Prodigy and Kasabian and have played several Irish and European festivals throughout their career. They have appeared on several television shows in Ireland, including Tubridy Tonight, WeTV, The View, Other Voices and The Cafe. 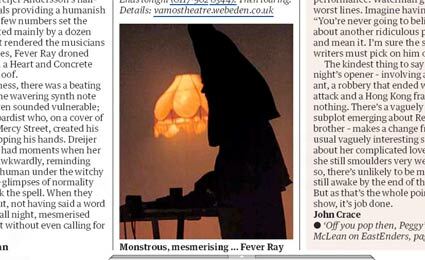 Last weekend I had one of my images of the previous weeks Fever Ray gig used in the Guardian. See below and click to enlarge.